Over the past fifty years, Fibre Glast Developments has supplied thousands of new customers with materials they had never seen, and taught them to use them successfully. However, we rarely discuss the lessons we have learned about organizing the composite shop itself. One of the most challenging hurdles a fabricator will face is just "how" to begin. This includes setting up their first composites shop. In the "Perfect" environment, there are always plenty of spaces to work, warm temperatures to quickly cure resin, and no fumes. In reality, most shops are cramped, dark and dirty. The ideal composite shop should be safe, clean, and well ventilated. To keep the work fun and comfortable, cutting racks and benches can also be built to store materials and hold molds at appropriate working heights. 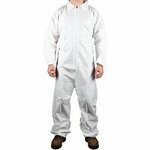 Safety is one of the most important features for any fabricator, lets take a look at some of the most common products you might find within a properly run composites shop. Composite materials can be quite safe when handled properly. All products should contain safety and general handling instructions on their material containers, make sure you are familiar and follow these practices at all times. You may also wish to check the Material Data Sheet (MSDS) for reach product, for further information. In general, limit personal exposure to the chemical resins by wearing gloves, safety glasses, an organic vapor respirator and protective clothing while handling them. If exposure does occur, quickly wash with soap and water. Finally, sanding and grinding dust must be kept out of the lungs. 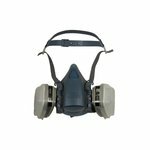 Always wear a respirator during the finishing steps, and vacuum up dust as it is created. Anyone who has ever worked with polyester resin in a closed room knows how overwhelming the fumes can be. Ventilation may be obvious with polyester resin, but it is just as important with epoxy. Some individuals are extremely sensitive to epoxy, and high concentrations of fumes can be enough to severely irritate the skin. If the lungs become irritated and inflamed, the affected individual may need immediate medical attention. Furthermore, sensitization can be developed over time in individuals who showed no previous reaction. This bleak picture can be eliminated with simple planning. An exhaust fan blowing out of a window near the workstation will often suffice. As the jobs get larger so do the ventilation demands. Make sure that an inlet source of fresh air is also available to create a cross-draft. Unfortunately, the cross-draft will cool a room during the winter months in most parts of the country. It will be necessary to maintain both ventilation and optimum resin curing temperature in the workshop to achieve good results. This is not the time to try to save on the heating bill. Maintain temperatures as specified on the product labels, or wait until the conditions warm up. General cleanliness and organization will save both time and money. Fiberglass and composite work can be a dirty job. However, at many professional facilities, the work areas are spotless. It appears that this is achieved in two ways. First, as much dust as possible is collected at the source. Tool guards with built in vacuum attachments are available and are the best way to contain dust. If this equipment is not used, simply tape the hose of a shop vac to the work surface. The vacuum will remove much of the mess. The second way professionals control contamination is to physically separate the various procedural steps of the lamination process. Most companies have clean rooms where reinforcing fabrics and vacuum bagging materials are stored, cut and handled. These materials are generally the most expensive and easily ruined, so building the storage racks and cutting tables is well warranted. Grinding and finishing are also separated for obvious reasons. If space is not a problem, set up a third room for laminating. If this is not possible, double up in the grinding area. Just don't expect to perform both tasks simultaneously. The clean room should remain just that: clean. Being comfortable in your work environment can be more important than you realize. Larger scale projects can be brutal on the back and arms due to the repetitive motions and distances which must be covered within molds. When building risers or benches to hold molds, make sure they are at comfortable working heights for the fabrication process. Fabric Racks Fabric racks are designed to keep your composites shop in order, keeping each roll of fabric safely stored and easy to measure out for each project. Each of Fibre Glast's fabric racks are durably built, and are suitable for up to 60" width fabrics. Cutting Station This composite cutting station is ideal for cutting your composite fabrics, with a tension bar and guide that will keep the fabric smooth and even through the cutting process. 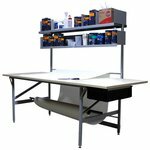 Complete Work Station An all in one design, the complete composites work station allows for storage of materials, fabric and supplies all in one. 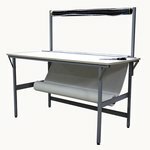 The extra large work table allows for plenty of room to work, with a tension guide and bar to keep your fabric clean and straight while working. To some, these suggestions may appear quite obvious. This subject was selected to help newcomers get off to the right start, but hopefully there are some organizational hints that everyone will wish to incorporate. To continue to gain the amazing advantages of composites for years to come, workers must respect the materials and take certain precautions now. This organization actually improves the comfort of working with composite materials and the quality of the finished parts. Begin planning like a professional and the results will be professional as well!